2013 will be a bellwether year for plug-in vehicles. 2011 saw the introduction of the Leaf and Volt. 2012 introduced the Ford Focus EV, Tesla Model S, Fisker Karma, Toyota Prius Plug-in, and others. 2013 will add the Chevrolet Spark EV, Fiat 500e, Ford's C-Max Energi and Fusion Energi plug-ins, and more. As of 1 December 2012, total plug-in sales for the year were 47,500. This is up more than 200% over 2011. Not as high as the optimistic numbers that some manufacturers and research firms predicted, but still an excellent growth rate. Even more important than the growth rate is the customer satisfaction rating. Plug-in owners love their cars. The enthusiasm abounds for them in the owners' circles. They create forums, blogs, fan pages, share mods, tips, and speculate about the upcoming changes. 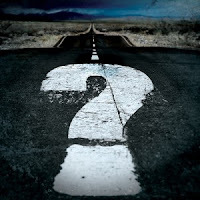 Sure, if you look hard enough you can find someone that walked away from an EV because they had unrealistic expectations or their needs changed, but by far the large owner surveys such as those by JD Power show that plug-in cars have the highest satisfaction rating of any vehicles being sold today. The title for this blog post came from a story that I recently heard about the fork. This humble eating utensil is arguably the most ubiquitous tool on the planet. This was not always the case. When the fork was first introduced to the western world, it had detractors. It was considered unnecessary, effeminate, and only needed by those who were not skilled enough with traditional implements. The fork, however, did find an enthusiastic niche. In Italy, it was hailed as the perfect device for twirling long types of pasta such as spaghetti and fettuccine. 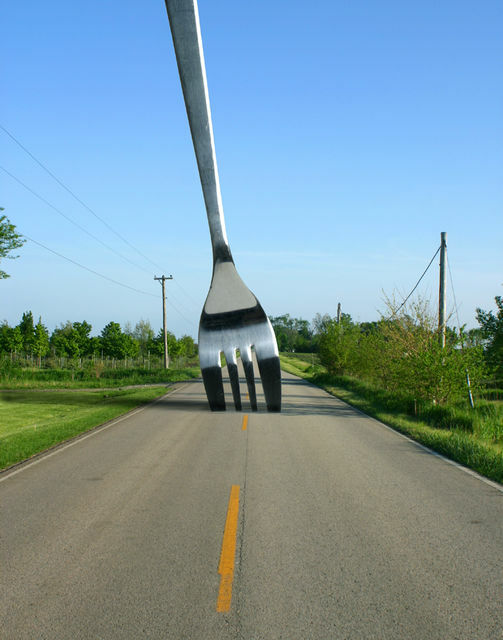 From here, hundreds of fork variations were invented to meet various needs. Tying this back to plug-in cars. From today's niche of enthusiastic early plug-in vehicles adopters, the market can continue to grow. More plug-in vehicles will be coming to market soon. If you want two-door, or four-door, or a particular manufacturer, or electric range, there will likely be options. SUVs and trucks are coming too. The Mitsubishi Outlander PHEV, for example, goes on sale in Japan soon. US sales, however, will not start until 2014. The pace of innovation is increasing. Battery technology is improving 8-10% each year. This allows the driving range, prices, and charge time to all improve with each model year. Technology improvements combined with more model options will practically guarantee that plug-in vehicle sales will continue to increase in 2013 and 2014. This will allow economies of scale to reduce the price tag while improving profitability. The internal combustion engine has had 100 years of innovation. Despite some incredible achievements the combustion engine of today is not much better than the 25 MPG engine of the Model T. We have been working on the wrong problem for 100 years. There is a fork ahead and it is time to take the road less traveled. The electric road. Let's help accelerate this change. If you own an EV, give your friends, family, co-workers, & neighbors rides or test drives. Let them know what you love about it and how nice it is to 'fuel up' in your own garage. Don't, however, just paint a rosy picture. Maybe a pure EV would not work for them so a PHEV would be a better fit. Having the right tool for the right job is what matters and what will make their plug-in experience a positive one. See you out there in 2013. Most electric vehicle (EV) owners charge their cars in their garage, overnight. At other times it is useful to charge while out and about. Charging on the road allows you to drive more than the range of a single charge and opens up more locations to your electrically-powered driving. 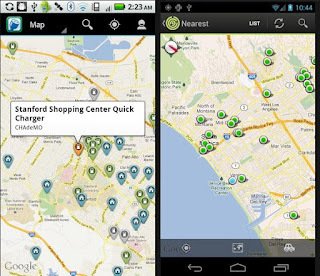 To charge up while away from home, you'll need to know how to find the charging stations that will work with your EV. These are two things we'll cover here. To help keep this at an introductory level, we will not be discussing Amps, Volts, kilowatt-hours, or any other electro-technical jargon when it can be avoided. Level 1: The slowest and most accessible is Level 1. This is the common US household outlet. To use this, you'll need to have a trickle charge unit. This generally comes with a new EV purchase. For a plug-in car like the Nissan Leaf or Chevy Volt, this will provide 4 to 5 miles of range per hour of charging. Not very helpful for a quick stop, but you can find these outlets nearly anywhere. Level 1 is sufficient for locations where your car will be parked for long periods such as workplace charging, an overnight hotel stay, or long-term airport parking. Level 2: This is the most common type of EV infrastructure currently being installed. These stations are the same voltage as a home dryer outlet. These stations have the J1772 connector, aka J-plug, built in so you won't need to bring any equipment. You will, however, most likely need a membership card to activate it. Below there is a list of these networks. These stations provide anywhere from 3 to 6 times the charging rate of a Level 1 station. To know how fast a Level 2 station will charge your EV, you'll need to know one detail: the rating of your vehicle's onboard charger. This is typically either 3.3 kilowatts (kW) or 6.6 kW. 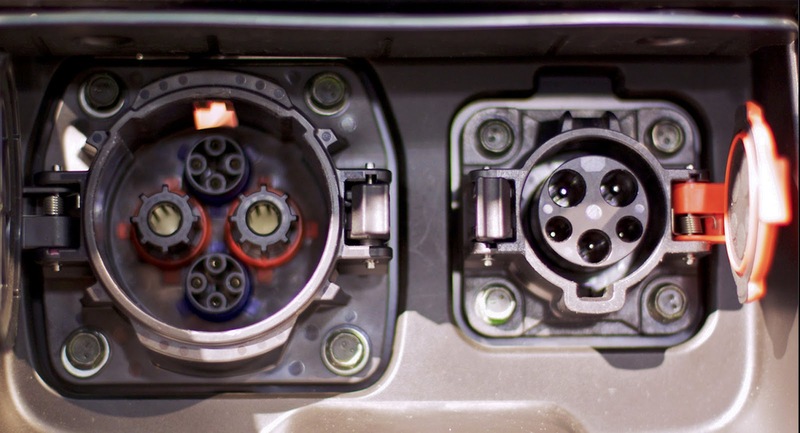 The 2011-2012 Nissan Leaf has a 3.3kW charger, while the 2013 model has a 6.6kW charger. Check your owner's manual for your vehicle for the charger's rating. A 3.3kW charger will provide a typical plug-in car with 12 - 15 miles of range per hour that it is plugged in. At this rate, a long lunch or similar stop, perhaps at your destination, can provide you with the range for the next leg or return trip. A 6.6kW charger will give you 24 to 30 miles of range per hour. DC Fast Charging: You might have assumed after Level 1 and Level 2, this would be Level 3. That might have been true if fast charging had been universally standardized. Unfortunately, it was not. Japanese manufacturers Nissan and Mitsubishi support a standard called CHAdeMO. BMW, Daimler, Ford, General Motors, and Volkswagen, on the other hand, teamed up with the Society of Automotive Engineers (SAE) to create a standard that will allow a single port to be used for Level 1, 2, and fast charging. This is called the J1772-combo connector. While this sounds nice to have a widely supported standard, there are currently no vehicles and no charging stations that support the SAE fast charge standard. CHAdeMO was the first to market and is the solution that the West Coast Electric Highway in Oregon and Washington state is using. The (coming soon) Chevy Spark EV is expected to be the first vehicle on the market to use the J1772-combo connector. We'll see if it can displace or co-exist with CHAdeMO. To further complicate the fast charging story, Tesla Motors didn't use either of the two methods we've discussed. Instead, they created their own, the Tesla Super Charger. Ignoring the confusion, the network that is currently installed in the Northwest is CHAdeMO, so we'll discuss this one. These stations will charge a Nissan Leaf from empty to 80% full in 25 to 30 minutes. This means that a quick 10 minute stop can get you 30 miles of range. This rate makes long distance drives possible. 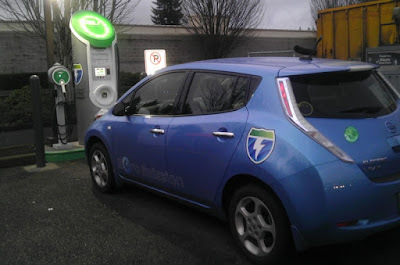 The fast charger in Woodburn, Oregon, for example, makes a trip between Portland and Salem easy in an EV. Now that you know the various types of charging, how do you find them? Many of the new EVs have navigation systems that include charging station locations. This is convenient since it is always there in your car, but EV infrastructure is being installed at a rapid pace and these built-in systems are often not up to date. Also, they do not provide you with real-time operational status or availability information. For this, you'll need a smartphone. There are apps written by the charging station manufacturers as well as crowdsourced apps that can tell you all of this valuable information. The two most popular charging station apps are PlugShare and Recargo. 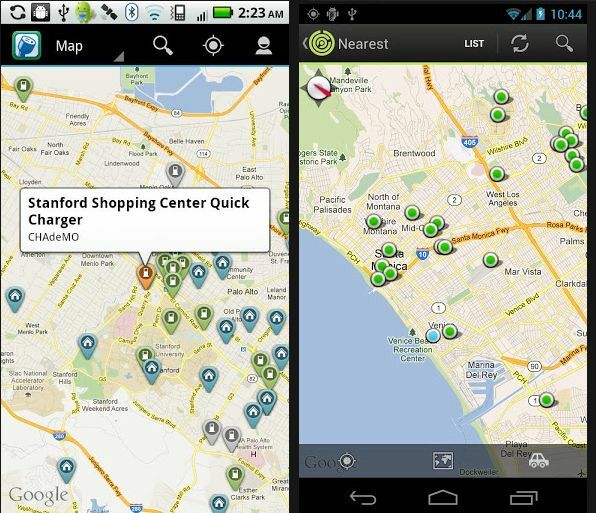 Both of these apps aggregate information from the charging station providers with user provided content. The status information can tell you if the station is operational and available. Users can check in at stations and provide status and location notes. These notes can be very helpful. While an address can get you to the area, a note can tell you that the charging stations at Lloyd Center Mall are on the second floor of the Northwest lot at Pole J12. Check-in reports can also tell you if the station has been used successfully recently. Rather than choosing either PlugShare or Recargo, I would suggest installing both of them. Their information, especially the user provided information, is not the same. Depending on what you are looking for, one may be more helpful than the other. ChargePoint (http://chargepoint.net/) - One of the largest networks in North America. Blink (http://www.blinknetwork.com/) - Funded by The EV Project, these are prolific in the Northwest US. AeroVironment (http://evsolutions.avinc.com/) - Selected for the West Coast Electric Highway in Oregon and Washington. For most EV driving, you'll have more than enough range for your daily needs. When you do intend to go on a trip beyond the range of your vehicle, make sure you plan it. Google maps or similar tools can give you accurate distance estimations. PlugShare and Recargo can show you the charging stations available on the various route options. As with any vehicle, occasionally, things go wrong. Make sure you have a backup plan. If you need charging and there is no EV infrastructure available, campgrounds are one source for emergency charging. Campsites often have 120V and 240V service. If you have a portable Level 2 unit and plug adapters, this can get you back on the road in an hour or two. You'll likely have to pay the typical fees to use the campground. In the extremely unlikely situation of running out of juice—which should never happen if you’ve planned ahead—it’s a good idea to have your cell phone and the phone number of roadside assistance. AAA now offers EV services, including roadside charging. If you come up just a mile or two short of your next charging spot, this could prove very helpful. But again, with an understanding of your vehicle’s range, the types of charging, and a few minutes of planning, your zero-emission journeys should be smooth sailing. 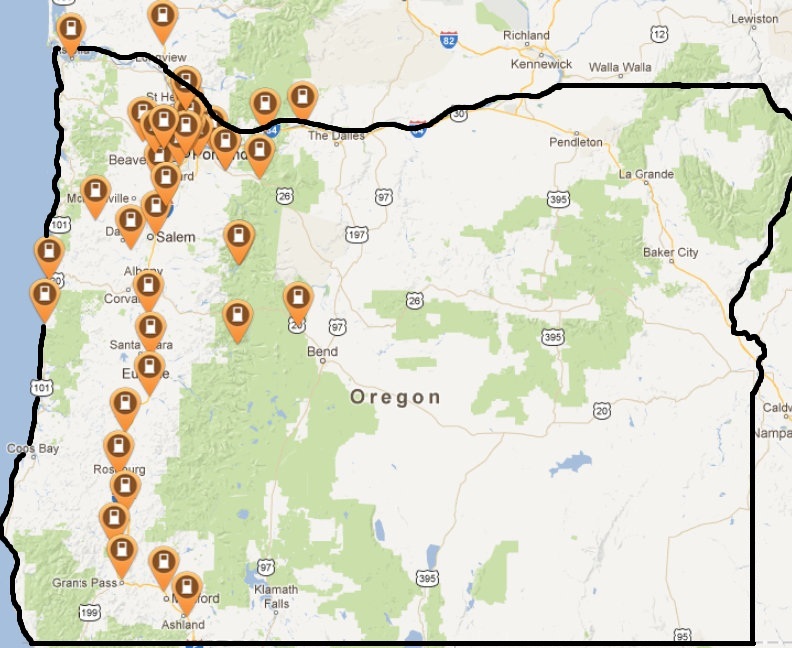 Oregon has more than 40 DC Fast Chargers. These chargers can add 80 miles of range to a Nissan Leaf in 30 minutes. Charging stations were recently installed in Newberg, Oregon at Newberg Chevron and in Grand Ronde, Oregon at Spirit Mountain Casino. I have been avoiding fast charging. Maybe "avoiding" is the wrong word. I bought my Nissan Leaf in 2011 as a commuter car. This meant that the bulk of my charging happens in my garage, overnight. As such, I have no need for fast charging in my day-to-day driving. However, these two stations allowed me to drive my EV to Spirit Mountain Casino. I have been going to Spirit Mountain Casino with a small group of friends once or twice a year for several years. It is a fun evening and, if you are lucky, you can leave with a little more money than you arrived with. On each of these prior trips, I have been a passenger. These two charging stations now allow me to take my car and drive the guys there in an EV. So last weekend, I did just that. From my home in Beaverton, Oregon, the door-to-door round trip drive is 110 miles; far beyond the range of my Leaf given the freeway speeds and elevation changes. 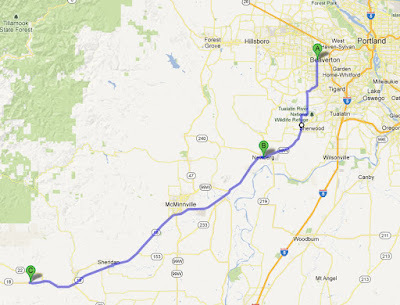 The Newberg station breaks the one-way trip there up nicely into a 17-mile leg and a 38-mile leg. Each of these legs is well within the car's range. The charging station at the casino means that the battery pack will be filled long before we are done playing and we'll be starting out the return trip with a "full tank". The trip went off without a hitch. We passed the Newberg Chevron and had to turn around to find it. 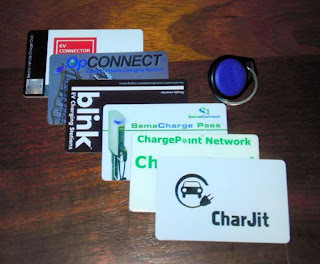 But once we were there, I plugged in and swiped my membership fob to start the charging session. We went into the convenience store and bought soft drinks for the road. Since we had not driven far yet, the was not much need to charge for very long. When we returned from the store, we unplugged and got back on the road. We made it to the Grand Ronde charging station with 22 miles of range to spare. We plugged in and headed to the casino. About an hour later I checked on the car via Nissan's smartphone app. I saw that the car was 80% full and had stopped charging. Opps, I have the car set to "Long Battery Life" mode. This means that it stops charging at 80%. I went out to the charging station and moved the car over to the level 2 charging station that is next to the fast charger to complete the fill-up. This freed the fast charger in case someone else showed up and wanted to use it. I also had the "EV Card" on my dashboard so another EV driver could contact me if they needed me to move the vehicle for some reason. After dinner, I again used the smartphone app to check on the car. The charge was complete and the car was 100% full. We still had a couple more hours of fun planned, and I could enjoy them knowing the car was ready whenever we needed it. We left the casino in the wee hours of the morning and headed home. 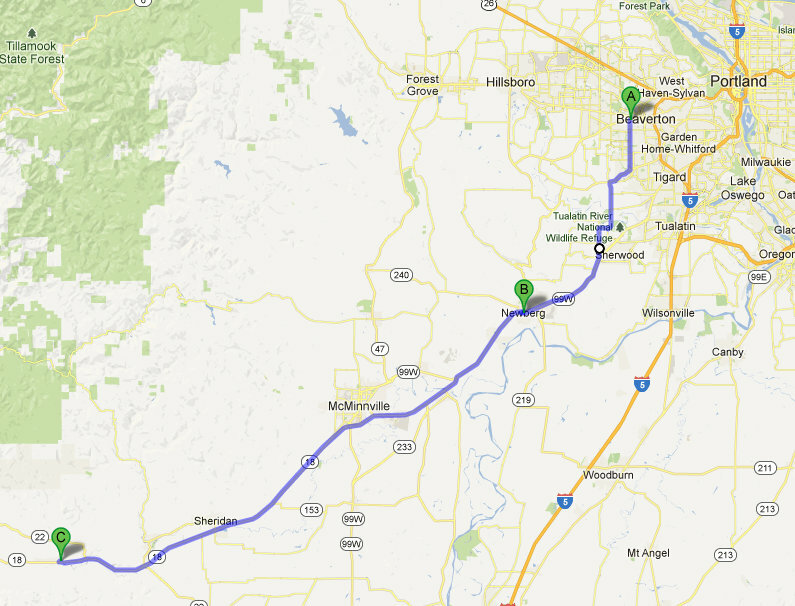 We again stopped in Newberg for a quick charge. We are now only 17 miles from home. And the range meter shows more than 30 miles of range remaining. I didn't need to fully recharge the batteries, I only needed enough to know that I could make it home. A quick leg stretch and I unplugged the car and we were back on the road. This stop was shorter than your average gas station refueling stop. When I pulled into my driveway, I had 18 miles of range remaining. It was nice to know that I could have skipped the Newberg station and still made it home but it was even better knowing that I could make it home with range to spare such that I was not stressing the batteries by deep cycling them. So we made it there and back again in a 100% electric vehicle. We had a fun time and our brief stops were for drinks and a bathroom break, during which time we also happened to charge for a few minutes at a DC fast charger.